This is a custom manufactured part, built to match a specific unique SecuriKey User USB Token. 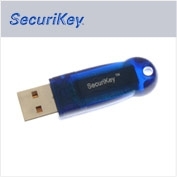 Compatible with SecuriKey Pro USB Tokens and SecuriKey User USB Tokens in SecuriKey Multi-User. This is a custom manufactured part, built to match a specific unique SecuriKey Admin USB Token. Compatible with SecuriKey Multi-User Admin USB Tokens. This is a custom manufactured part, built to match a specific unique SecuriKey Enhanced Logging Edition User/Group USB Token. Compatible with SecuriKey Multi-User Enhanced Logging Edition only.